I became aware of the name Buffy Sainte-Marie in the 70's. However, I never sought out her music because I always thought of it being along the lines of Joan Baez or Peter, Paul and Mary. But as Sainte-Marie explained on Thursday night, though she may have sung a traditional folk song or two in her time, she essentially is a songwriter. Buffy Sainte-Marie set contained 23 well crafted songs which fit under the broad headings of rock and country. Many, if not most, of Marie's songs are written from an activist point of view but still manage to be accessible as opposed to alienating. After giving it some thought, I realized that the accessibility of her music is an extension of her warm and optimistic personality. It was 9:39 when my friend Mark said "I guess they're running a little late." 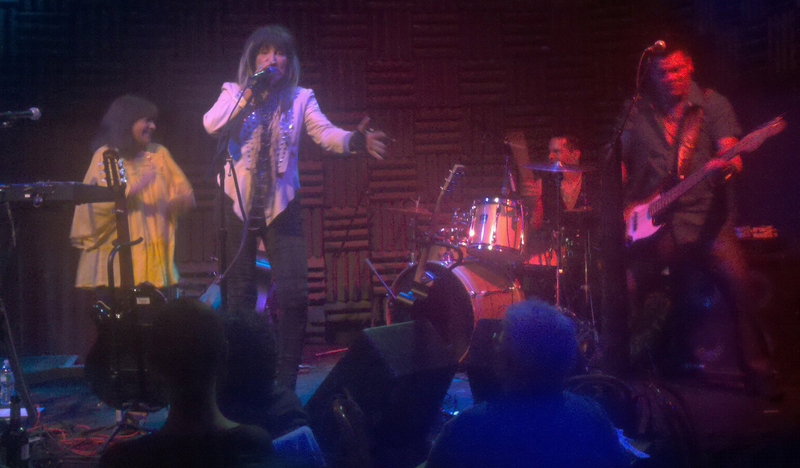 A minute after Mark noticed the time, Buffy Sainte-Marie joined her three band mates on stage. My first impression was the band looked like they belonged to a motorcycle gang The guys especially looked like they could be Cher's best buds in the movie Mask. 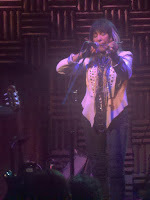 Buffy Sainte-Marie opened up her set on guitar with "The Piney Wood Hills." Since this was the first time hearing (or remember hearing) Sainte-Marie's voice, the last note of each phrase she sang acquainted me with her trade-mark quivering vibrato. Even though "The Piney Wood Hills." still had it's country flavor, the song took on a rock feel when drummer Jesse Green's even kick - snare beat came in after the second chorus. 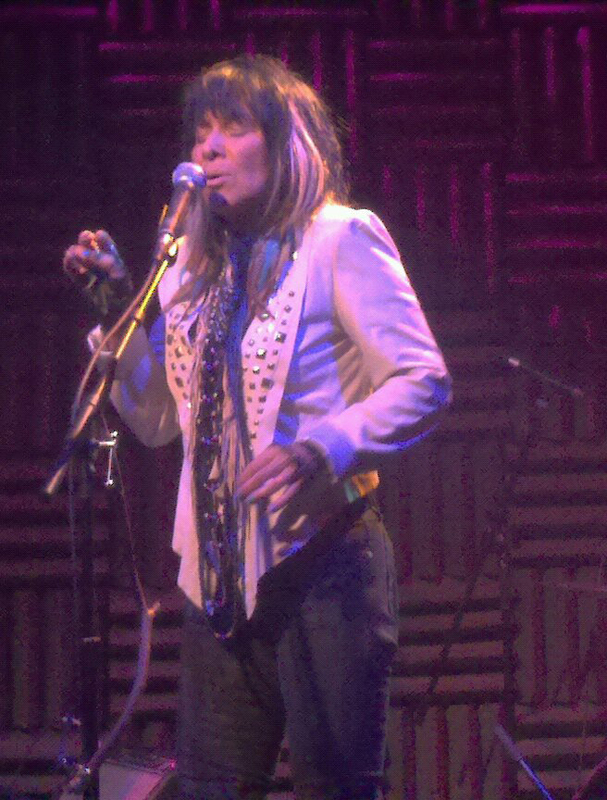 The second song Sainte-Marie sang was a real rocker and included a native American chant. The song was called "Cho Cho Fire." Sainte-Marie's cultural background influences a great deal of her music; She is considered an activist for the native American Indian. (Sainte-Marie is actually Canadian. "American" refers to the entire continent, not specifically the USA). The feel of the song also felt like something Tina Turner might sing. Or maybe I was just thrown by Sainte-Marie not holding a guitar and moving in a stance that looked a lot like Turner's. Sainte-Marie mentioned several times that she lived in New York in the 60's and before her forth song made reference to being black listed in the 70's. She said "....there were a couple of administrations that wanted me out of town - but I had a friend in Big Bird." The latter part of her statement was a reference to her 5 year stint on Sesame Street. 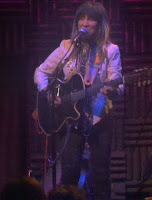 Sainte-Marie performed solo for the song "Cripple Creek." She accompanied herself by playing a mouth bow. As I was doing research for this review, I came across a very cute video of her singing the song on Sesame Street with Fred the Wonder Horse doing harmony. It's worth checking out on YOUTUBE. Regarding the song, "Generation," Sainte-Marie told the audience "this is one of those songs that didn't get airplay in the 70's." The song had a chorus that was both provocative and bizarre. At least that is the way I felt hearing it more than 30 years after it was written. The line that caught my ear was "Goodbye stars of Hitler, goodbye Bankers Trust, Aquarius is shining and the sun is one of us." The rest of lyric doesn't rhyme and it's meter is awkward at best. I appreciated the songs history and activism but as for the lyric writing on this one - not so much. Before doing "I'm Gonna Be A Country Girl Again," Sainte-Marie sort of defended performing another country song by saying "So many styles of music, it doesn't matter what you call them it's all music." Actually there was something about the song that felt really honest. It was one of my favorites in her set. Throughout Sainte-Marie's show she made references to different parts of her long career. Outside of those references and an audience with a median age rage of 50 plus, I would have been totally unaware of Sainte-Marie's age. 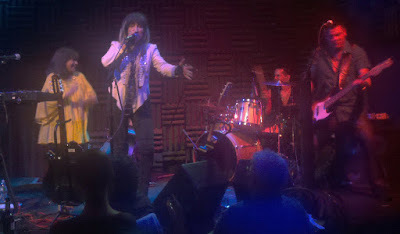 At 69, she seemed to gracefully move through a 23 song set without any lack stamina. I knew that Sainte-Marie wrote "Until It's Time To Go" but had no idea that so many people had recorded it and that Bobby Darin was the first one. Before doing the song, Sainte-Marie told us about writing it and receiving 18 yellow roses from Darin. She then made light of it by saying, once she saw the movie (Beyond The Sea), she realized he sent roses to everyone. If there is any song that definitely classifies Sainte-Marie as a folk artist it's "Little Wheel Spin and Spin." I know I've heard it several times through the years but can't remember when or where. Sainte-Marie started the song by herself on a black acoustic guitar. The band came into the song on the second chorus, Mike Bruyere joined in with tambourine and Donny Ducharme repeatedly played a single note on his bass. One of my favorite songs in the entire set was "Fallen Angels." The song's title works well as a very catchy hook. Sainte-Marie played the song on the Roland keyboard using a piano patch with a chorus on it. She introduced the song by dedicating it to whistle blowers everywhere. I believe she said that the song was inspired by Oliver North and Iran Contra. The one song in the show that wasn't written by Buffy Sainte-Marie was by "Rellocation Blues", written by actor and songwriter the late Floyd Westerman. Sainte-Marie referred to Westerman's part as Chief Ten Bears in the film Dances With Wolves. Sainte-Marie sang the song a cappella while tapping out a heart beat on the her microphone. 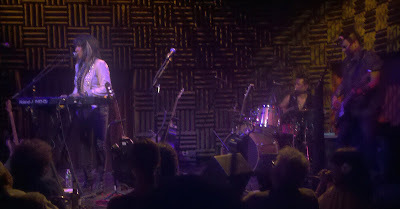 During the song she did some quivering high pitched Indian singing which made her sound like early Yoko Ono. Before moving on to the next song Buffy Sainte-Marie said something that really resonated with me. I don't even remember what came before concluding with her statement. What she said was "A song can do more to explain things than a 400 page book." If those "things" equal emotions, she is probably right. Sainte-Marie sang "Up Where We Belong" as the lyricist. She sang the basic melody within her range and spoke the bridge. Her arrangement was not as dynamic as Joe Cocker and Jennifer Warnes' version but felt as potent because it came from the source. 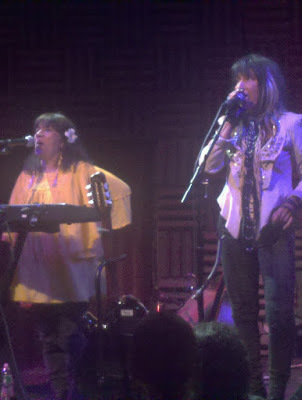 For "No No Keshagesh" Sainte-Marie brought up Soni Moreno to do background vocals. Moreno tours with Sainte-Marie, so I didn't get why she wasn't on stage from the get go. "No No Keshagesh" was another rocker from the new CD which had some native american singing in it. I liked the song and the way the verse held on awhile before the chorus came in. We returned to folk music one more time when Sainte-Marie did "The Universal Soldier" with it's message of individual responsibility. Sainte-Marie softened the heavy handedness of the song's message by explaining how she saw wounded Vietnam vets returning from war and how she came to the conclusion that she turned into a song. Sainte-Marie moved through the very country "He's A Pretty Good Man.." and on to "The Big Ones Get Away" which was very 80's rock radio. "Big Ones" reminded me of something Don Henley would write like his song "Heart Of The Matter." Before performing an intimate but scary song about opiates titled "Cod'ine," Sainte-Marie mentioned that the song was recorded by both Janis Joplin and Cortney Love. Heaven help me but all I could think was "Wow -What a shocker! Maybe she can send Amy Winehouse a copy." Sainte-Marie stated that as a adolesant she loved Rockabilly. She said she used listen to artist like Bo Diddly, Bill Haley and Comets, and Buddy Holly before even learning the guitar. 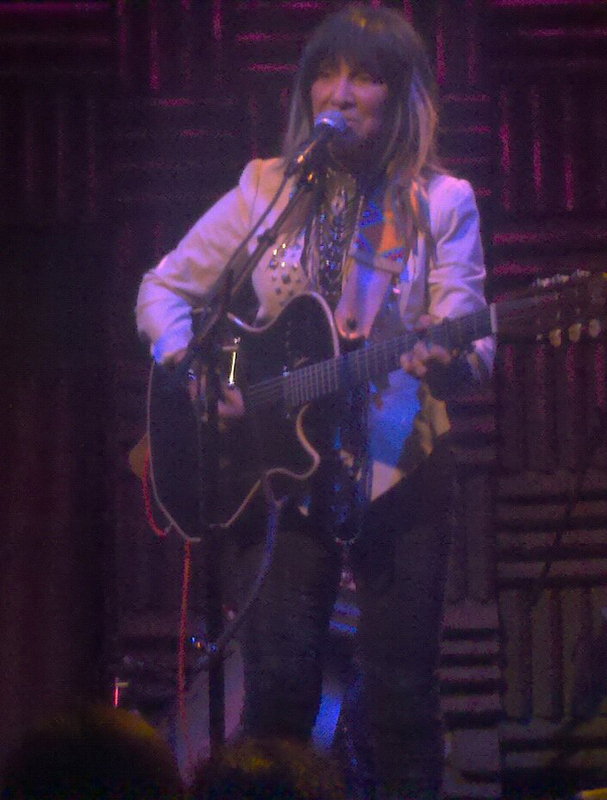 She then performed "Blue Sunday" which reminded me very much of Elvis Presley's "That's Alright Mama." All through "Bury My Heart At Wounded Knee," I kept thinking that I would love to hear it as a straight up reggae song. There was just something about entire song that screamed reggae. Sainte-Marie dedicated the last song of her set to all the generations past. Considering that 99 percent of the people in the room had to be adults for at least 3 decades, they've had to have seen quite a few generations. I thought that after doing twenty one songs that Buffy Sainte-Maire wouldn't do an encore. I expected her to come back out, bow and walk off stage again. Either she doesn't believe that less is more or she believes in doing every show like her last. Whatever the case she returned with two more songs and I have the feeling she could had done another 23. Before actually doing the first song of the encore, Donny Ducharme's bass amp went out. So, a tech from the sound booth who also happened to be named Joe came on stage to help. Sainte-Maire, along with Soni Moreno who returned on stage for the encore, calmly waited. Once Joe quickly adjusted the amp Sainte-Maire and her band performed "He's An Indian cowboy In The Rodeo" with a native Indian tribal tag which I assume was the "+ white fish track" title on her set list. The last song was "Goodnight" which she probably uses as the last song for many of her shows. 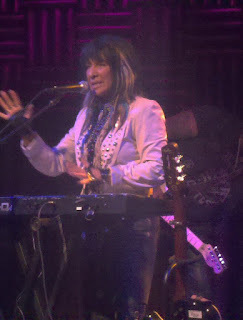 On my walk home I felt really glad that I got see Buffy Sainte-Marie because she is a bit of a legend. I appreciated her songwriting and a felt in awe of her long music career. 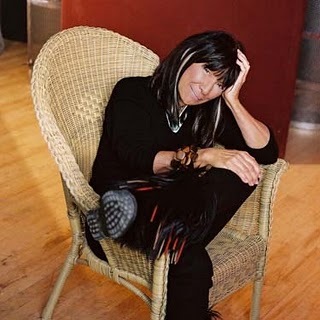 I can't say that Buffy Sainte-Marie's music made me want to run home and download every last bit of it, but that is only because I'm hearing Buffy Sainte-Marie's music after the fact rather than before. If I had heard Sainte-Marie 40 years ago, like most people in the audience did on Thursday night, I'm sure I would still be a fan today. As a 58 year old who was first exposed to Buffy St. Marie when I was 17, I thank you for your review. I see there is a lot of music I have missed over the years.